The Italian Registry of the Historic Houses of Excellence is the Italian archive that for 20 years has been promoting and giving value to the historical heritage through the Quality Certification of the Italian historic houses. 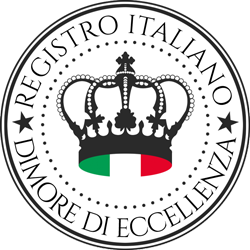 After the first level certification (Quality Seal – whose symbol is the Tricoloured Crown), there is a more important level issued by the Italian Registry of the Historic Houses of Excellence: the Seal of Excellence (whose symbol is the Golden Crown). Only a limited selection of castles, old residences and valuable villas can present themselves as candidates for the Seal of Excellence. After obtaining the Quality Seal, they undergo a series of 100 rigorous controls established by the Excellence Certification Protocol. The historic residences that gain the best score obtain the merit of "Historic House of Excellence" and can be proud of their Seal of Excellence, the prestigious Golden Crown that distinguishes the best Italian historic houses.